..........................sorry about the title. I had a bit of a "junior moment". 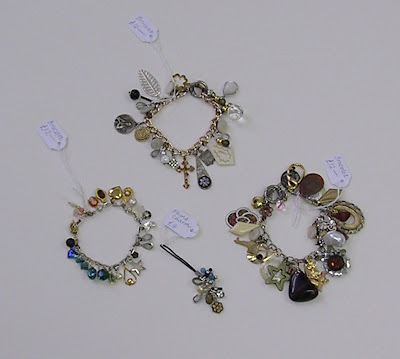 These 4 phone charms are all for sale, at £3.50 plus p&p, each. 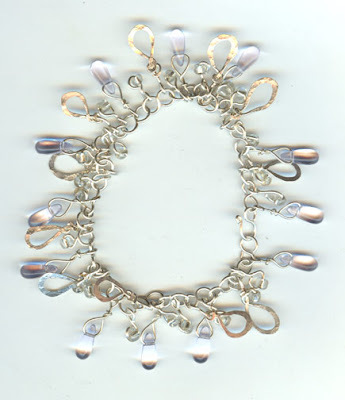 the second is made of a lampwork focal bead, opalite accent beads, and vintage seed beads. 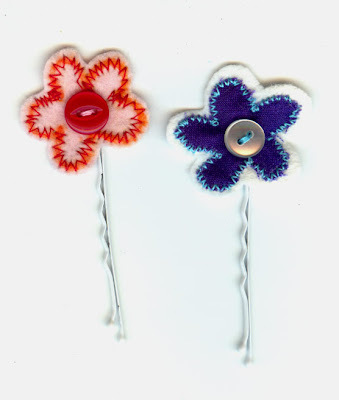 the third is made of dyed turquoise, and red seed beads. 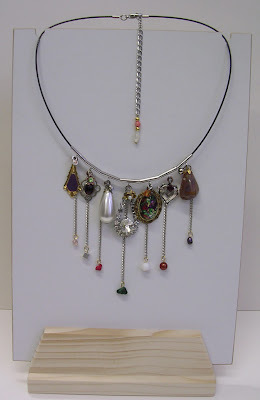 this is a new (and already the 2 necklaces have sold!) 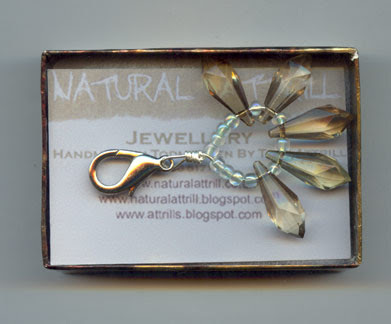 range of my reclaimed jewellery, which i delivered to Spirals in Hebden Bridge about a week ago. 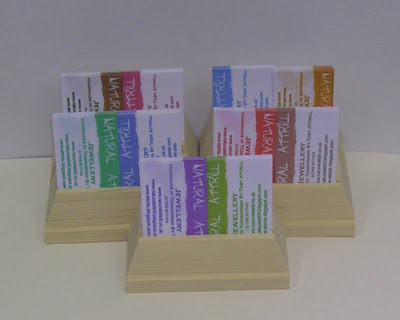 Lots of new naturalattrill business cards in a rainbow of colours, displayed in especially made little wooden stands! In the first picture you can see a tangle of old Christmas decoration, given to Toby by a lady who buys quite alot of his creations from a shop in Todmorden, 'Vanilla Pod'. She thought Toby might be able to do somthing with it, as he likes to reuse and recycle. 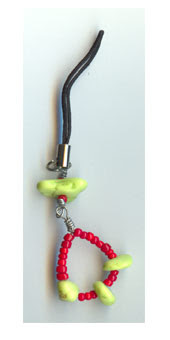 As a 'thank you', he made this zip/bag charm for her, using some of the beads reclaimed from the decoration. Quite a transformation! 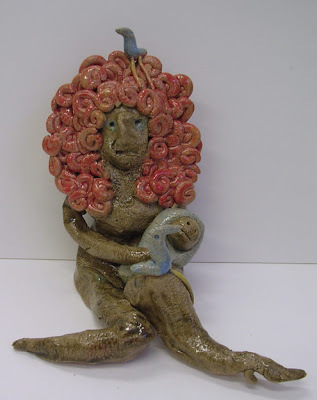 CLICK ON PHOTO'S TO ENLARGE AND VIEW IN MORE DETAIL The top ceramic figure is by Toby, a really lovely quirky little lady with massive red curly hair, a baby and 2 bluebirds. 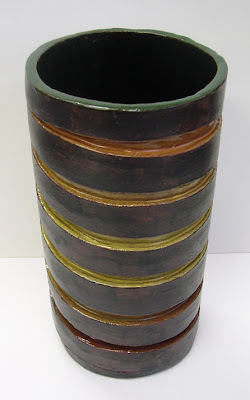 Below, a wonderful big and heavy pot by Laurence, the dark brown has an almost leather look to it, and inside the pot, the green glaze, and also the spirals, have a contrasting shiny finish. The second photo is of another new range of recycled jewellery, the first lot had sold out, so i gave Spirals these, and now all 3 of these bracelets have sold! So i am off to the carboot sale tomorrow to search for more lonely earrings and charms in need of a new home to make some more bracelets. We had a phone call last week from Spirals, saying that a customer had asked for one of Toby's button necklaces, but they'd run out. She wanted a green/blue/brown colour theme, choker length. 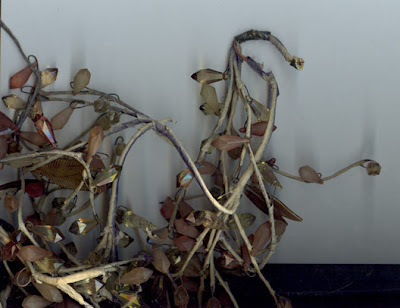 After a visit to the bead shop to buy lengths of cord in various colours, Toby chose a few drops from his vintage glass chandelier collection, then off to his bedroom to wade through jars and trays full to the brim with old buttons. 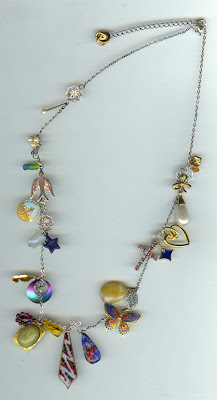 He spent most of the weekend making jewellery, then I drove him to Hebden Bridge to deliver his creations. 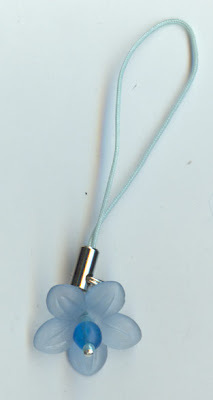 Here you can see the final results, two knotted necklaces, the size is adjustable, using the loop and buttons. The lady can choose, hope she likes at least one of them! the other can stay in the shop for sale.